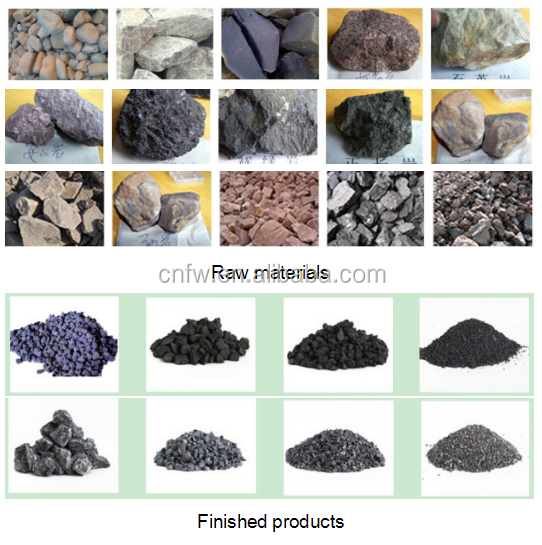 The raw material is evenly sent to the jaw crusher for rough breaking by the vibrating feeder. The coarsely broken material is sent to the fine jaw crusher or the impact crusher for crushing again. 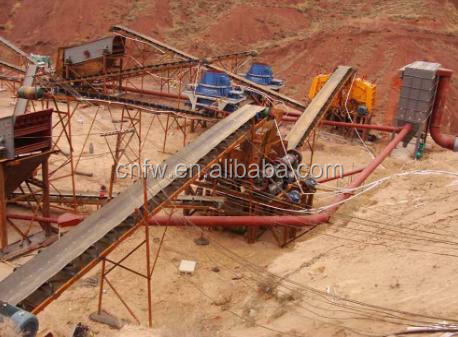 The crushed material is sent into the vibration by the belt conveyor. The sieve is sieved to meet the grain size of the sand making machine, and the stone sand machine is used for sand making. 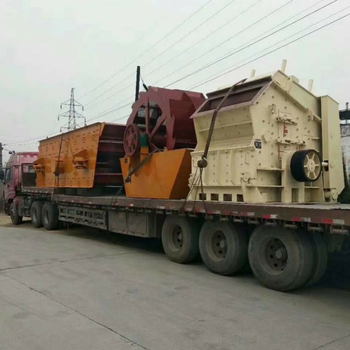 The returning fine crusher (impact crusher) that does not meet the requirements is re-crushed, and the stone from the sand making machine is again Entering into the vibrating screen for screening, screening out the sand that meets the requirements, and entering the sand washing machine for cleaning. After cleaning, it is transported by the finished conveyor belt, which is the finished product; the sand and gravel mixture that does not meet the requirements is sent to the sand making machine for crushing again. 1.Vibrating feeder: Used to send the raw materials to the crusher for crushing evenly and quantitatively to avoid any blockage at the feeding port ,easy and convenient operation. 2.Jaw Crusher: Used for the primary crushing of the raw materials .high efficiency ,low failure rate . 3.Jaw Crusher: Used for the secondary crushing of the raw materials .high efficiency ,low failure rate . 4.Sand making machine: It is an important equipment for producing artificial sand. It can crush the material to about 30 mesh. It has excellent finished product, good grain shape and strong processing capacity. 5.Vibrating screen: There are two layers, three layers and four layers in the sieve layer. It can separate the materials with different grain sizes after crushing. The screening efficiency is high, the operation is reliable, and the operation and maintenance are convenient and fast. 2.What is the Warranty ? Our warranty time is one year except the wearing parts .but our service is lifelong . 3.What is the payment terms ? 4.How can i visit you ? We have one office in Zhengzhou city and we can pick you up very easily from airport or train station. 5.How can get a quotation ? The best is sending inquiry to us directly or leave message to us online and we will reply you within 24hours with more details. Any more questions or Concerns ,please contact us freely,we are always here for you .